Koçtaş, the leader in the Do It Yourself retailing market, was once again voted the "Most Recommended Brand" in the furnishing and decor sector. The market leader with a total sales area of 241 thousand m2 in 45 Koçtaş and 12 KoçtaşFix stores located across 22 provinces, Koçtaş served some 11.5 million customers in 2015. Koçtaş continued to revise its business plan and modernized its category/product management and retail stores to become the destination of choice for customers in 2015. In return, the Company reached a brand recognition of close to 100%, and a customer satisfaction index 4 points higher than the sector average for customer loyalty. Given the effect of rapidly changing technologies and socioeconomic conditions on customer expectations and shopping habits, the Company has introduced numerous firsts such as KoçtaşFix stores with an average sales space of 200 m2, the multiple channel shopping experience and "Tıkla&Gelsin (Click to Order)" kiosks. The Fix format, aims at greater proximity to customers to meet their simpler, on the spot repair and maintenance needs, continued its growth with six new stores launched in Istanbul in 2015. The renewed Internet shopping channel grew by 18% over the previous year, while the rate of mobile shopping rose by 110%. The "Tıkla&Gelsin (Click to Order)" kiosks currently present in all KoçtaşFix stores and allowing access to 17 thousand additional products are planned to be installed in other Koçtaş stores in the coming period. Koçtaş ranked 49th in "The 100 Most Valuable Turkish Companies" survey by Brand Finance. In addition, a study by Accenture Turkey, Vodafone, Boğaziçi University, METU and the Turkish Foundation for Information Technologies showed that Koçtaş was one of the 17 most successful Turkish brands that are "Digitalization Pioneers," with an index above 80%. Digital marketing campaigns carried out in 2015 helped Koçtaş win a total of five awards at Crystal Apple, Mixx Awards and the Direct Marketing Communication Awards. Furthermore, in the annual survey by the Association for Shopping Center Investors, Koçtaş was once again named "The Most Preferred Brand" in the furniture and decoration category. 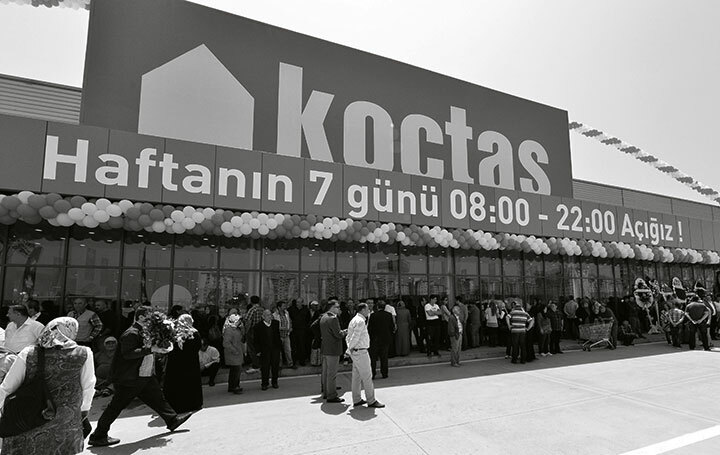 In the process of inaugurating new stores and carrying out social responsibility projects, Koçtaş delivers its vision of "better homes, better lives" to new provinces. In this sense, Koçtaş renovated the Mentally Handicapped Children's Dormitory in Samsun, after the Adana and Kocaeli. After the opening of two new stores at İstanbul Kurtköy Viaport and Göztepe Emaar Shopping Center, Koçtaş will expand its extensity. In addition to the large format Koçtaş stores, the Company plans to rapidly open smaller scale KoçtaşFix stores in urban, downtown locations. By prioritizing those cities where it has no store presence yet, Koçtaş will continue to create value for its stakeholders and its customers across Turkey.